Hi, and thanks for looking at my site, I’m here to help you play harmonica better. Life seems to have given me a mission – to play the harmonica, and encourage others to play the harmonica. 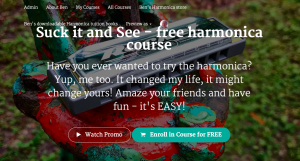 I’ve found I love teaching harmonica and with so many students (over 28,000 on-line) I think I’ll keep going for a while. Skype lessons are very popular right now as people want personal feedback on a one to one basis. 30 minutes once a week is the most popular request. Not too onerous, learn one new thing a week and not too expensive. Ask me! I recently got the top job in the UK harmonica community – Chairman of the HarmonicaUK – so now you need an appointment to talk to me! *HARMONICA HOTLINE 07973 284 366 – If you have any harmonica related questions you can call me. You can get rid of the ‘subscribe’ box by clicking the white text ‘close’ button on the top right.